The club announced what could be the final list of friendlies today but there could be one or two late changes. As previously known we are to play just two League 1 clubs this year with the visits to Aggborough of Walsall and Cheltenham - no Villa, Wolves, Blues or Baggies then. For the first time in ages we will be taking in a game at AFC Telford with our first ever visit to the New Bucks Head. When we used to go there back in the nineties the place was, literally, a tip with ash from the power station used to create a cinder bank behind the one goal. It's now quite a smart little stadium and also getting filled with fans now for a change. There are a gaggle of former Harriers there now that Matty Lewis has just signed for them, former reserve Inderpaul Khela, Gary Birch, Steve Pope and also Dean Craven (right), he of the one game at Altrincham fame. 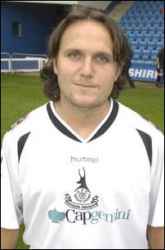 Sadly our former keeper Stuart Brock will not be there because he's just been placed on the transfer list. The other highlight is the visit of FC United of Manchester to Aggborough. This controversial club were formed by a Manchester Utd fans group while the takeover of the Premiership giant was un-folding. It seems that the reason why they are coming down here for a friendly and not the other way around is because the rent on the ground that they are using for their games, Bury's Gigg Lane, is too high. It'll be interesting to see them anyway and the game does have a novelty value. As you can see the other games are not all that exciting and are just there to make up the numbers.